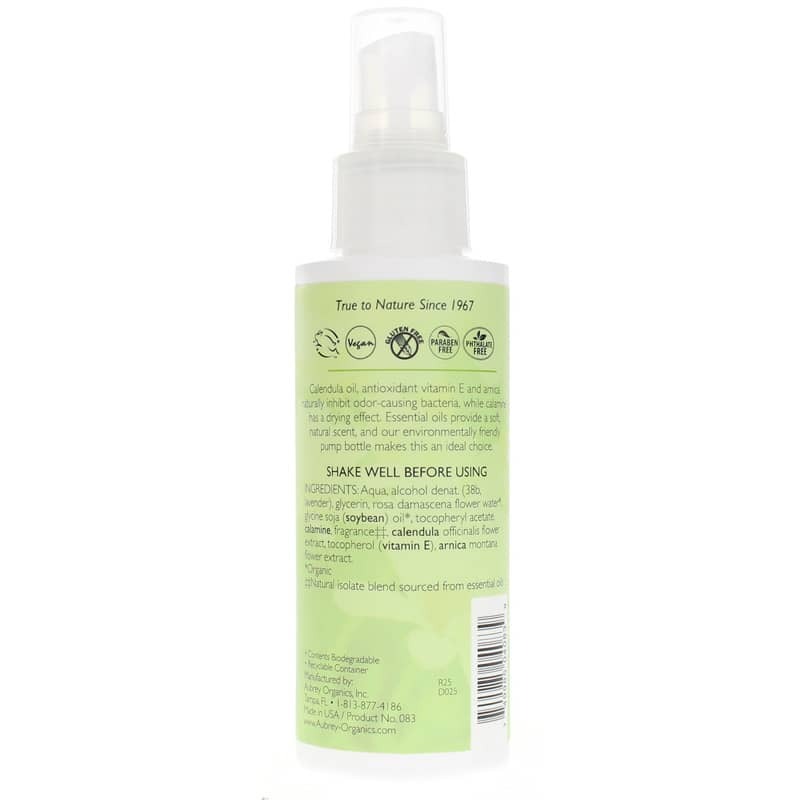 Calendula Blossom Natural Deodorant Spray contains calendula oil, antioxidant vitamin E, and arnica, which naturally inhibit odor-causing bacteria. It also contains calamine which has a drying effect. 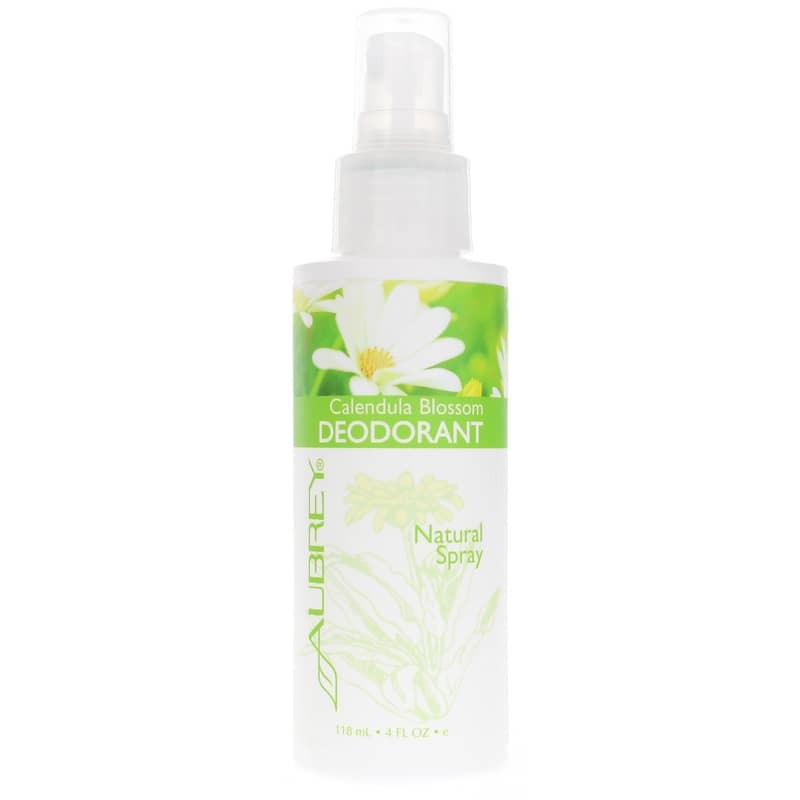 If you prefer the convenience of a spray, this herbal deodorant will keep you naturally fresh all day without irritation. Essential oils provide a soft, natural scent. Aubrey Organics uses only the finest herbal, plant extracts and natural vitamins in all of their products. You will find no paraben preservatives, no petrochemicals, no artificial colors or fragrances of any kind. They use sustainable, plant-based all-natural ingredients in their products and packaging that is biodegradable, recyclable and recycled. Aqua, alcohol denat. (38b, lavender), glycerin, rosa damascena flower water*, glycine soja (soybean) oil*, tocopheryl acetate, calamine, fragrance**, calendula officinalis flower extract, tocopherol (vitamin E), arnica montana flower extract. I love this deodorant! I have been looking for something that did not have all the harsh chemicals and this worked! Not only does it smell great but I feel confident wearing it. I thought the sweating would be a problem but as long as you wait a few seconds for it to dry before putting your shirt on, you should be good to go! Love it! Only natural deodorant that has EVER worked!! I've tried literally dozens of natural deodorants and this is the ONLY one that has ever worked for me. It is long-lasting and although the smell is rather strong (you have to love patchouli) it gives me all day coverage, even in hot and humid weather. It has a musky scent (not floral or citrusy, even though that's how the company describes it). But, like I said, it is awesome!! It has an more of a herbal smell vs a perfumy smell. What I like is that it does a pretty good job of countering sweat smells without including antiperspirant.